These principles can be strengthened by the sharing of great stories about remarkable people. I’ve chosen some of my favorite Lee and Low books that provide strategic opportunities for discussion around these principles to support students to consider who they are and who they want to be. The following biographies shed light on real people who led their lives by strong principles. I’ve chosen some of my favorite passages from these books alongside text-dependent questions that incorporate the five core principles. Consider creating a biography text set for your class where students have the opportunity to read across texts. Discuss how these figures were alike, how their lives were different, and which core principles guided them. View videos like the Make the Difference campaign and consider how the children in Koh Panyee relate to the biographical figures in these texts. 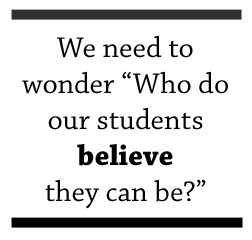 Then, ask your students “Who will you be?” and listen. How does Hart’s support of Sammy demonstrate a trusting relationship? How does Sammy share his “voice” with the world? What does Sammy overcome to persist in his pursuit of diving success? Reflect on Sammy’s journey. What can we learn from his life that relates to our own lives? What specific moments in the text can you refer to in support of your ideas. 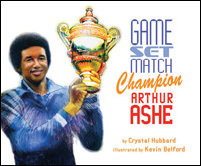 Who supports Arthur Ashe in his quest to become a tennis champion? How does Ron help Arthur to become a sportsman not just a champion? What does Arthur overcome to persist in his pursuit of tennis success? Reflect on Arthur’s journey. What can we learn from his life that relates to our own lives? What specific moments in the text can you refer to in support of your ideas? How does Nellie, Flo’s mother, demonstrate care to her family and to her customers? What encourages Flo to share her voice and to persist with her passion for singing? How does Flo set high expectations for herself? Reflect on Flo’s life journey. What can we learn from her life that relates to our own lives? What specific moments in the text can you refer to in support of your ideas? In what ways does Soichiro persist in his dream of learning how a car works and making one himself? What obstacles did he face in achieving his dream? How does Soichiro share his voice with the world? Reflect on Soichiro’s life journey. What can we learn from his life that relates to our own lives? What specific moments in the text can you refer to in support of your ideas? What are defining moments for William Hoy in his journey to become a major league baseball player ? How does he show pride in what he does even before becoming an inspirational figure? How does William Hoy demonstrate determination in pursuit of his dreams? Reflect on William Hoy’s life journey. What can we learn from his life that relates to our own lives? What specific moments in the text can you refer to in support of your ideas? Where does Anna May find her true self? How does Anna May demonstrate determination in pursuit of her dream to be a film star? What obstacles does Anna May face in achieving her dream? How does Anna May’s determination for quality roles make a difference for not only her own life but for the lives of girls from all backgrounds who deserve meaningful roles in films? Reflect on Anna May Wong’s life journey. What can we learn from her life that relates to our own lives? What specific moments in the text can you refer to in support of your ideas?